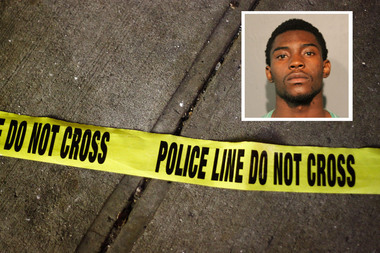 Laquan King, 20, is charged with two counts of first-degree murder. COOK COUNTY CRIMINAL COURTHOUSE — Authorities say a man wrapped his face in a T-shirt and ambushed a West Side dice game, killing two teens including one who tripped and fell as he tried to run away. The alleged killer, Laquan King, grabbed the teen who tried to run by the head and executed him, prosecutors alleged in court Thursday. Nineteen-year-old Jerome Phelps was hit in the neck, shoulders, ribcage, hip, buttocks and leg, Assistant State's Attorney Molly Donnelly said. Prosecutors didn't reveal a motive in the 9:45 p.m. Aug. 16 attack in the 1600 block of South Springfield Avenue. But they said King, 20, wrapped a T-shirt around his neck and the bottom part of his face before walking up to the game. He was with an accomplice who has not been found, prosecutors said. According to Donnelly, King pulled a gun and shot the first victim, 16-year-old Caprice McCollum Jr., in his head. As several witnesses scrambled to run away, Phelps tripped and fell. King picked up Phelps' head and shot him multiple times, Donnelly said. King and his accomplice ran off, authorities said, and McCollum and Phelps were both pronounced dead at local hospitals. Witnesses on the scene were able to identify King and his accomplice in a photo array, according to prosecutors. Police found nine spent shell casings. King, of the 1400 block of South Ridgeway Avenue, was arrested Monday and charged with two counts of first-degree murder. He was previously convicted as a juvenile in 2011 for delivery of a controlled substance and sentenced to two years probation. Cook County Judge Laura Sullivan on Wednesday ordered King held without bail.